I woke up this morning with this photograph of our granddaughter, Sophia, waiting for me in my g-mail. Labor Day weekend marks the end of summer here in the U.S. There is no similar holiday in the Netherlands. But the change of seasons is marked, there as here, by the beginning of school. For Sophia that means splitting her 3 year old attention on two schools–Dutch School and British School–both located near her home in Amsterdam. It is important to her parents that she be comfortable speaking Dutch and English. A great way to accomplish this goal is to send her to schools where she will be encouraged to speak, read and think comfortably in both languages. 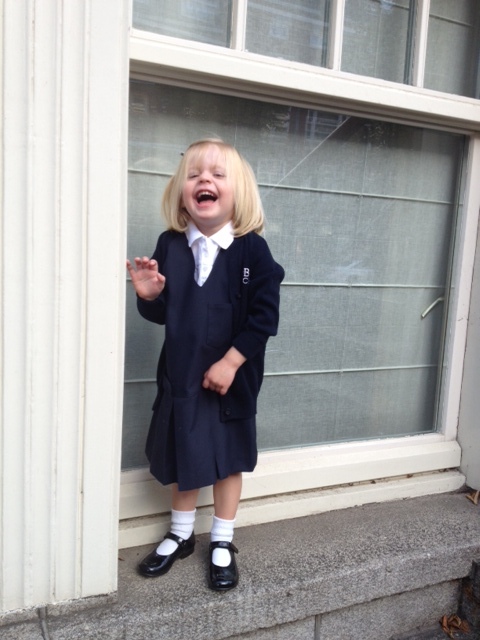 Here she is in her uniform for British School. To Sophia, school is all about fun, friends and activity. For the moment, we wouldn’t have it any other way.